The Roman Catholic church, the main religious body in Cameroon has issued conflicting comments on the conduct of the October 7 presidential election in which incumbent Paul Biya was declared the winner. Church bells ring at Our Lady of Victories Cathedral in Yaounde, inviting Catholics to a mass to be said by metropolitan Archbishop Jean Mbarga. Mbarga says the special mass is to pray for peace in Cameroon and salute the victory of President Paul Biya in Cameroon’s October 7 presidential election. He says people should congratulate Paul Biya for his victory especially as electoral disputes were handled in a transparent manner by the constitutional council. 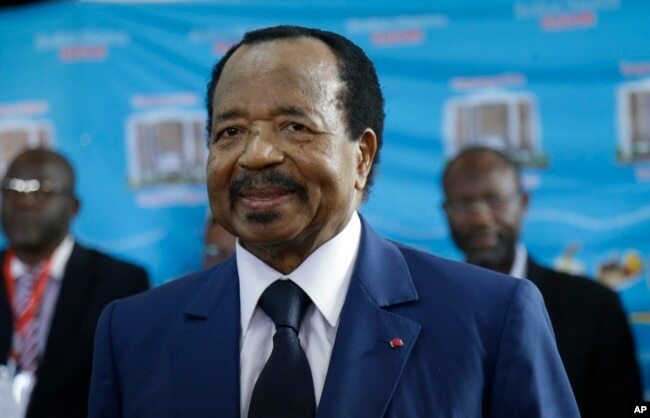 He says everyone should recognize Biya as the president elect, start preparing for the next election and thank God for the peace that was observed during the presidential poll. 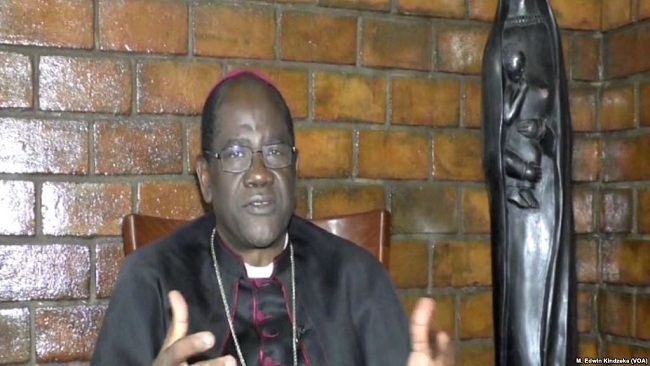 The archbishop’s declaration that the election was transparent sharply contradicts the position of the episcopal conference of Cameroon Roman Catholic bishops of which Mbarga is a member. 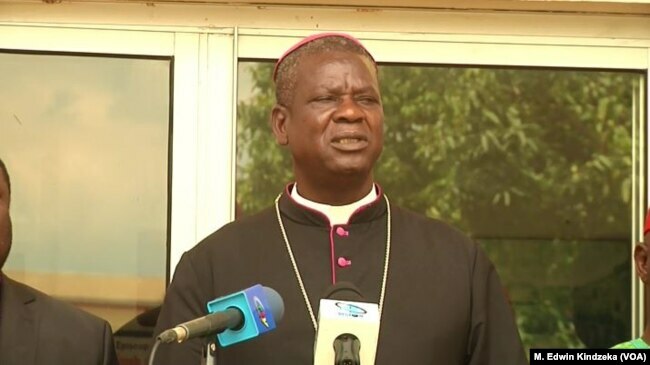 Samuel Kleda, archbishop of Douala and president of the episcopal conference had criticized the election saying that the large turnout announced by the elections management body ELECAM along Cameroon’s northern border with Nigeria, was particularly suspicious. Archbishop Samuel Kleda of Doulala on an outing with Protestant and Muslim clerics in Yaounde, Cameroon, Sept. 19, 2018. Kleda said that the fighting in the English-speaking Northwest and Southwest regions and the Boko Haram insurgency along Cameroon’s northern border with Nigeria had displaced large numbers of people and they could not vote. Kleda says he is surprised at claims that the ruling party candidate Paul Biya scored overwhelming victories in many parts of Cameroon including the English-speaking northwest and southwest regions where they themselves said they were unable to go to campaign because of galloping insecurity. He says petitions filed by opposition party candidates that the election were marred by massive fraud and did not even take place in several regions ought to have been taken seriously by the government because Cameroon’s unity is threatened. Cameroon’s Roman Catholic bishops have been divided before, even though it has never been as public as it is now. When the separatist movement in the Anglophone regions became violent, Kleda condemned the government troops for brutality, while some bishops, including Mbarga, said it was legitimate defense. An estimated 35 percent of Cameroon’s 24 million people are of the Roman Catholic faith. Cameroon’s President Paul Biya, of the Cameroon People’s Democratic Movement party, waits to cast his vote during the Presidential elections in Yaounde, Oct. 7, 2018. On Oct. 22 incumbent Paul Biya was declared the winner with 71 percent of the vote, with his main challenger, Maurice Kamto, only receiving 14 percent. Several opposition candidates accused Biya’s ruling Cameroon People’s Democratic Movement (CPDM) party of massive electoral fraud to keep the 85-year-old leader in office for another seven years. Biya is Africa’s longest serving president, having entered office in 1982.